While you may know of Laura’s work from her lovely and popular quilt adaptations to needlepoint she also has many wonderful Blackwork designs. She compiled all the patterns and variations of patterns she has designed into this wonderful book. There are over 600 designs in all, divided into three groups of small, medium, and large patterns. The book begins with a short introduction, explaining the consistent symbols she uses throughout. Unlike traditional Bargello, which uses one color with only occasional accents, these patterns are designed to use up to 3 color plus beads. There is also a short chapter explaining the different stitches in Blackwork. Each of the patterns is shown three ways, with 1, 2, or 3 colors (or 3 colors with embellishments). Sometimes the patterns are just alternate ways to color them, sometimes they have additional stitches that give them a different look. Each pattern also has a short description that talks about the pattern, possible uses, or additional variations. Helpfully for the needlepointer, and like some Blackwork books, the patterns show the individual stitches. They are not numbered, so that you can choose your working method and work out the pattern based on that. I love that the book divides the patterns up by size, although I wish the different chapters were more clearly indicated. Paging through the book, the patterns range from simple to complex but none are difficult. Although not indicated in the Table of Contents, there is a chapter of border patterns, 26 in all, following the large patterns. The book finishes up with a gallery of many of Laura’s blackwork projects. 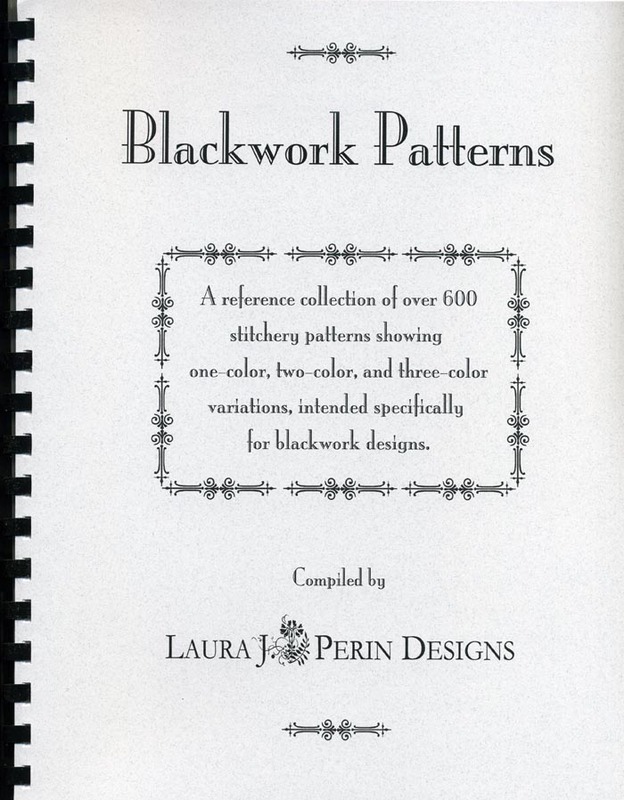 It’s an idea-filled book, perfect to inspire using blackwork in your needlepoint. Do you have any idea where one might purchase this book? I looked at a couple of my usual sources and not a smell of it did I find. Thanks. Some needlework shops stock it, but you can also buy it directly from Laura. Click on “blackwork patterns’ on her site and information about it is in the left sidebar.